Our 2007 Book which is now "out of print" is here for our Members. 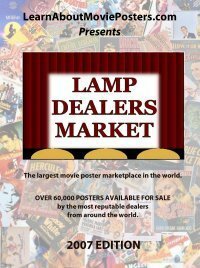 It is the only book of it's kind that was on the market with OVER 60,000 POSTERS FOR SALE! The Dealers Market was an experiment in compilation so we could find out the problems that were involved. The major problem that we found was that we wanted to expand it beyond the 60,000 but that amount put the publication at 800 pages which was the maximum that we could print without going into volumes. In other words, it would be too expensive to expand it beyond that point. jSo consequently, all future expansions will be online and we have no intentions to publish another book of this type. We found that there are several major benefits in utilizing this type of list, such as: (a) utilizing it as a price guide to see what dealers from around the world are selling a particular poster for; (b) for valuing your collection for insurance purposes; (c) in purchasing, being able to see who else might have the same poster, and then compare prices and conditions; (d) to compare shipping costs... for example: a dealer from a different country will normally charge you a LOT more for the shipping; (e) to be able to make personal contact for any negotiations. So having a list where several dealers might have the same piece available give YOU a lot more freedom. You will notice that since we have over 30 major dealers from around the world, we placed the prices into 3 columns to cover US$, Euros and British pounds. We also had to put the dealers in by code. We have the Dealers Codes listed here for your convenience. The list here links back to their Dealer Page and contact information. WAIT!!.. Before you go diving into all the lists.. there is one more thing that you need to know. We have put the list in a pdf format, so you must have Adobe Reader (which is free and comes standard on most computers) to see the list. When you open the list. it will look very scrunched up. Move the percent size to 100% for normal reading. ALSO: for searching - just click on the binoculars and a search bar will appear. OK.. now you're ready to go..... HAVE FUN!! !